Just $10 sponsors 1 dozen COOKIE VALENTINES delivered to our wounded warriors spending Valentine’s Day at Walter Reed National Military Medical Center! Any remaining funds will be donated to fight childhood blindness through the EmesArmy LCA Research Fund. A HUGE THANK YOU to those that have sponsored our vets year after year! With your help, EmesARMY has delivered thousands upon thousands of cookie valentines since 2012! 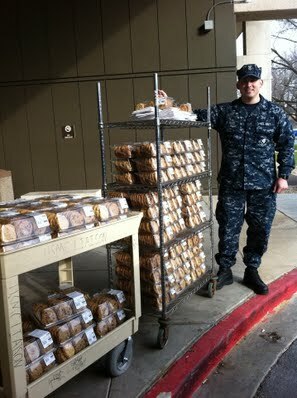 EmesArmy sent 2400 Cookie Valentines to Walter Reed National Military Medical Center during our inaugural year in 2012! This is our 5th year! EmesARMY hopes to have every state represented! Please SHARE this page with your family & friends across the USA!! Check our facebook page starting in February for our famous Cookie Map & see how your state is doing! Every $10 donation sends 1 dozen cookie valentines! A $100 donation sponsors 10 vets getting 1 dozen each! PLUS~You can include a personal note at checkout that will be written on a cookie bag! For more information, email EmesArmy@gmail.com. Follow Eme's Adventures on Instagram!